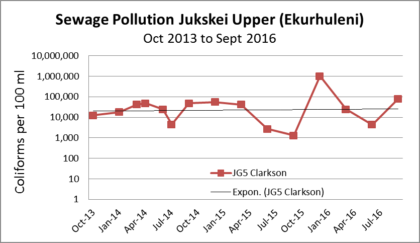 Read here for more background to the Jukskei River catchment and its problems. 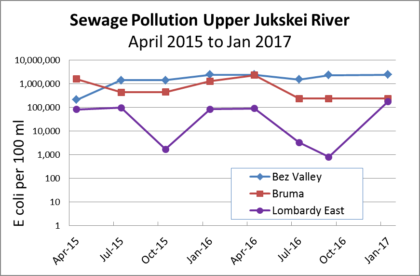 The site highest upstream is Bez Valley (corner 4th St and 5th Ave), where sewage pollution appears fairly level at an average of 2.1 million E coli counts per 100 ml. Downstream at Bruma E coli have declined to an average of 750 000 and at Lombardy East to 23 000. Ekurhuleni tests coliforms (also an indicator of sewage pollution) at Clarkson Rd in Morninghill, Bedfordview. Over three and a half years there is no trend, but there is a seasonal low in winter. 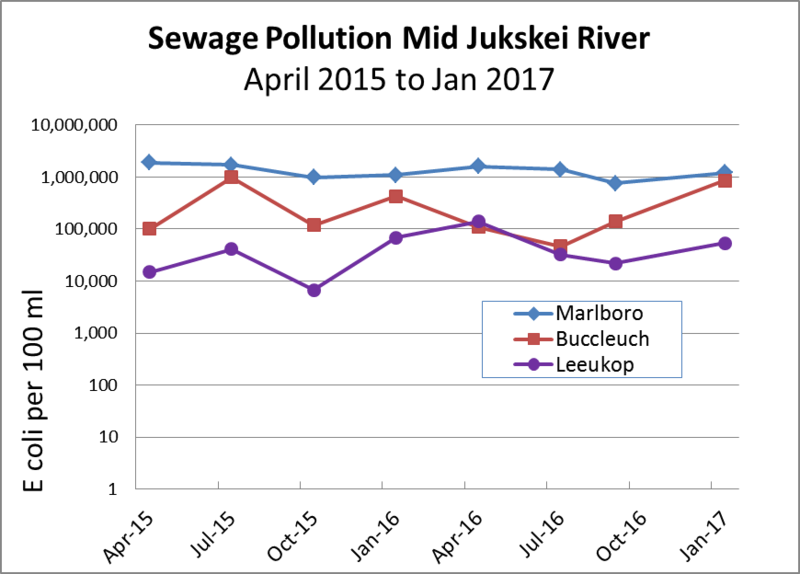 The first monitoring site after Alexandra is Marlboro Bridge, where the E coli counts per 100 ml are fairly constant and above 1 million. 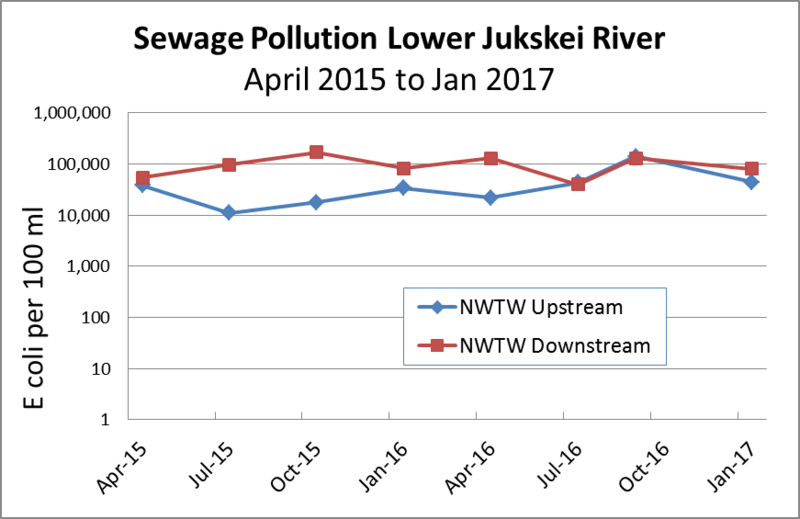 Two sites downstream show lower pollution with a more marked winter low, but there is no overall trend. 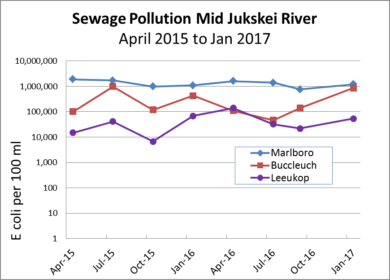 The E coli counts downstream from Northern Wastewater Treatment Works (NWTW) are fairly constant around 100 000 per 100 ml, which is about 5 to 10-fold higher than at the site upstream. 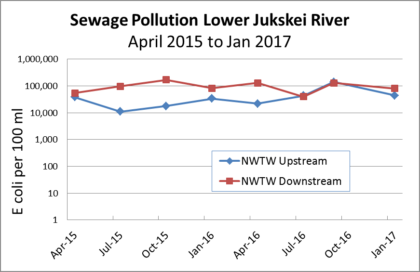 This shows increased sewage pollution from the NWTW. 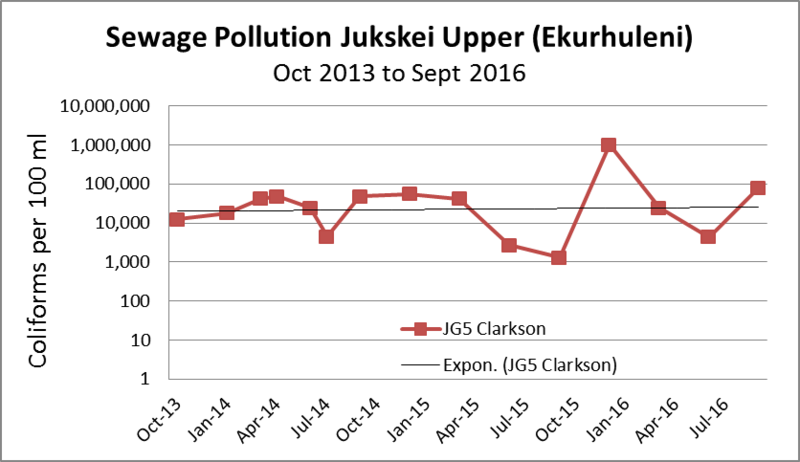 The last two quarters are very similar, due to an increase at the upstream site. There is no trend over time. 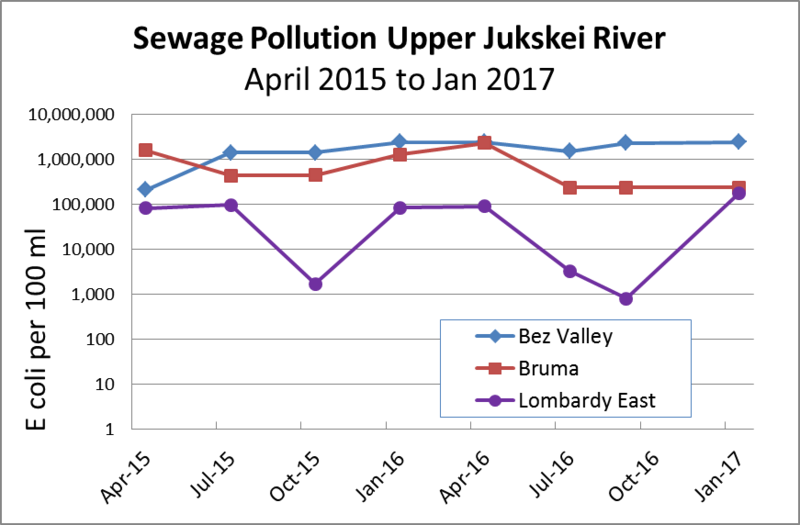 I stay in St Andrews and have noticed that the smell from the Jukskei river is particularly bad at the moment. This is only at night with visible foam, and I don’t know if it is because it is cooler at the moment but I am not happy that my family and pets are breathing this stench in all night. I am no expert but it has a smell of sulphur. Is there a company releasing chemical pollutants into the river at night? Its from a sewage spill into the Queens Wetland, which was stopped on Wednesday 3 May, but will take time to clear. See my more recent post. 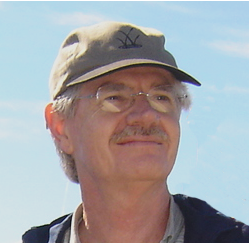 I would very much like to have a conversation with you about montoring the river quality on the Jukskei. I am a member of the Gauteng Canoe Union and have taken it upon myself to find a way to link our community with the information and activities of people and groups concerned with water quality on the river.